Do you have one or several missing teeth? Dental Implants might be a solution for you! Most patients with missing teeth are good candidates for dental implants. A consultation with one of our surgeons will help us determine your needs while giving you the proper information to make an informed decision. Dr. Daniel was the first surgeon to introduce “Dynamic Surgical Guidance” by Navigate Surgical in Atlantic Canada in 2018. This technology is free-hand guided surgery with real-time motion tracking of the clinician’s handpiece and patient position. All based on one pre-operative CBCT scan that enhances the long-term success of implant-supported restorations. What is the process of placing Dental Implants? First, your local dentist needs to assess your situation and see if dental implants are a suitable option for you. Your jawbone and gums need to be free from inflammation and other diseases to qualify. If dental implants are an option for you, then a referral is sent to a specialist. During the initial consultation with the specialists at ECOS, the type and quality of your jawbone are assessed to see if it can support an implant. This is completed using a 3-D cone beam scan. This type of X-ray enables the clinician to analyze your bone structure and recommend dental implants in a safe and predictable way. Specialists at ECOS use advanced digital tools such as the Nobel Clinician program in order to obtain a blueprint of the jaw bone prior to the actual surgery-taking place. This program enables the surgeon to provide optimal implant placement, maximizing aesthetic and function for patients. Implant placement are usually outpatient procedures. We do most of our implant placement procedures with local anesthesia or IV sedation to make the process as smooth and painless as possible. As each case is different, the surgeon can choose to place in one or multiple-step procedures. 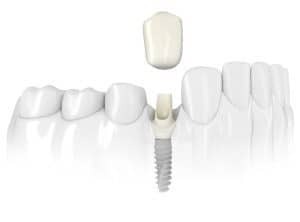 Diagnosis may vary as each case is different, but a temporary crown or bridge can be placed on top of the implant right after surgery or after the implant has healed to the jawbone. Your local dentist will do this step. ***Be advised, the costs of the crown or bridge will be separate than the actual implant placed by the surgeon. 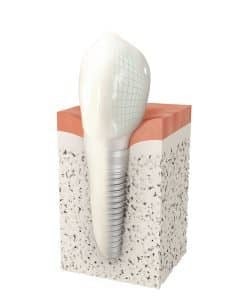 For the implant to heal to the jawbone (also a process called ‘’osseointegration’’) it can take between a few weeks and up to 6 months. While this is taking place, a dental lab designs and manufactures your final tooth, which is then attached directly onto the implant with a small screw or directly attached to the abutment. 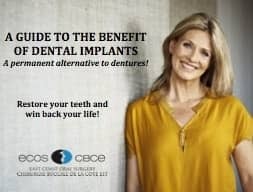 For more info about Dental Implants, please call our office today! ***Have you ever been told that you can’t have implants as you don’t have enough bone? We may have the solution for you.